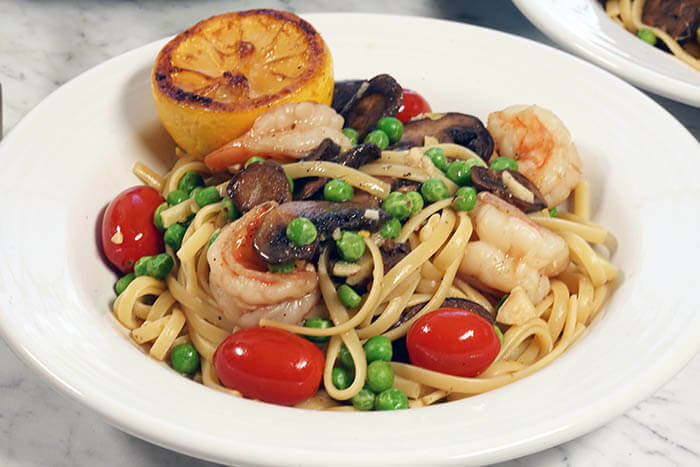 Shrimp Scampi Linguine combines Tender shrimp mixed with lightly sautéed vegetables in a light and lemony garlic wine and butter sauce. This meal is fancy enough for a dinner party! However it takes about 20 minutes from start to finish! So it’s perfect for a weeknight meal. It is light and flavorful with a pop of spice from red pepper and black pepper. 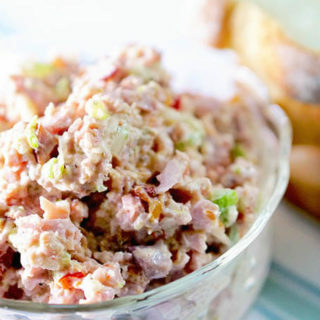 Super simple and so delicious, it’s a meal your whole family will love! 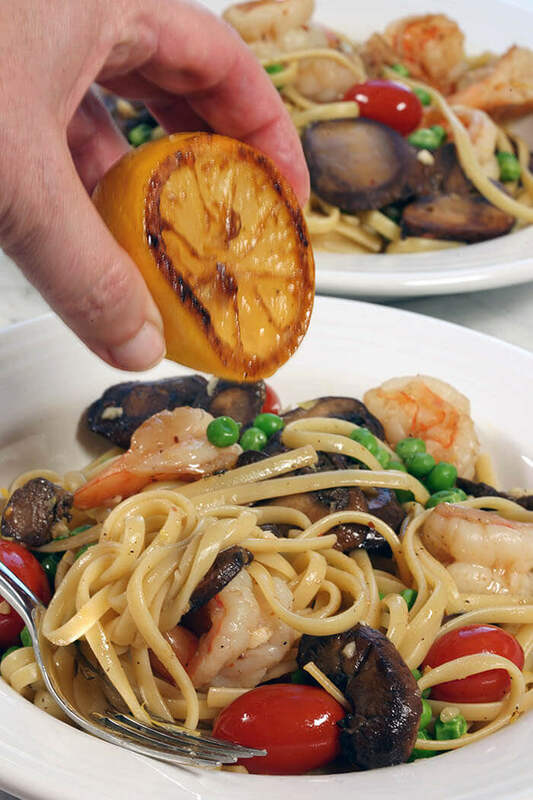 Shrimp Scampi Linguine – tender shrimp in a light lemon garlic sauce mixed with bright fresh vegetables! When we were little we often drove over to the beach. Mom and Dad would pack us up and off we’d go to spend the day. My folks would take their clam shovels and dig razor clams and brother Don and I would follow along, getting into mischief whenever possible. We were very mischievous. There’s a difference, right? Don would walk over to a tide pool and say something witty like look Debbie there’s a starfish and of course I’d always run over to check. Somehow he’d talk me into getting closer to find it and then throw a rock in the tide pool and splash me with water. Of course I’d cry, then I’d tattle on him. He would get in trouble. Then I’d follow him to the next sand dune and do it all over again! I don’t think I ever learned, but that’s ok – I have the BEST big brother ever, of that I’m quite sure! It was ok for him to pick on me – but anybody else? WHOA Nelly! He made sure that never happened. When we got home, dinner would be all seafood – clam fritters, fried oysters and shrimp! Still one of my favorite meals! 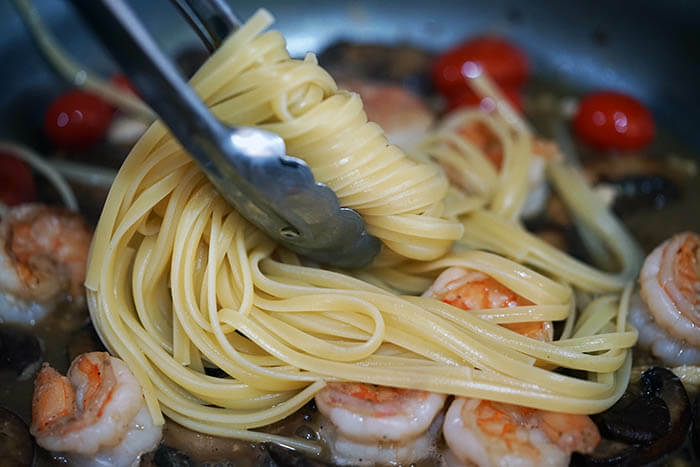 Really anything with seafood is a favorite and that’s why I wanted to share with you my recipe for Shrimp Scampi Linguine. 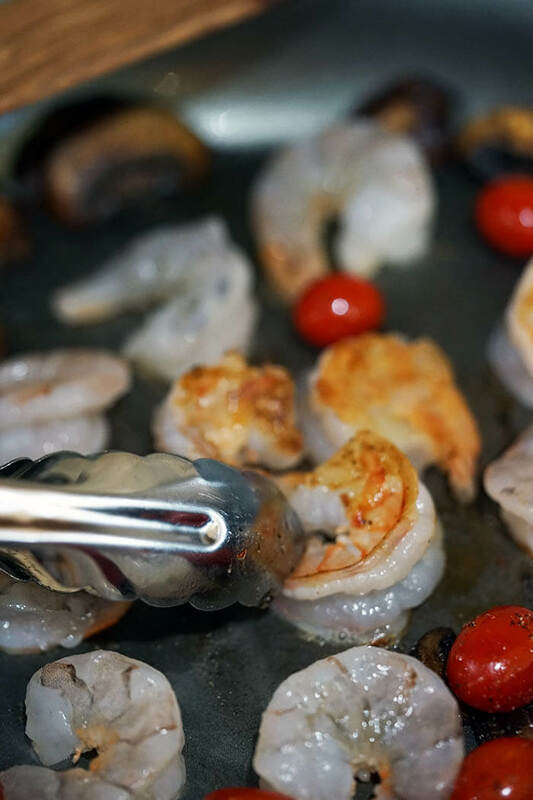 Grilling a lemon gives it a smokey flavor that is a delicious finish for Shrimp Scampi! Today I partnered with Grocery Outlet. Right now the Grocery Outlet Wine Sale is going on – that means 20% off EVERY bottle of wine! It’s definitely time to head to Grocery Outlet to stock up! What is in a Scampi Sauce? Shrimp Scampi sauce is a light sauce and often served with pasta or rice. A great bread to sop up the sauce is always a bonus! When it comes to the wine, never cook with a wine you won’t drink! Pass right by the “cooking” wines in the baking section. Head to the wine section. For shrimp scampi, choose a dry chardonnay. That will pair best with this meal and can be served right alongside! 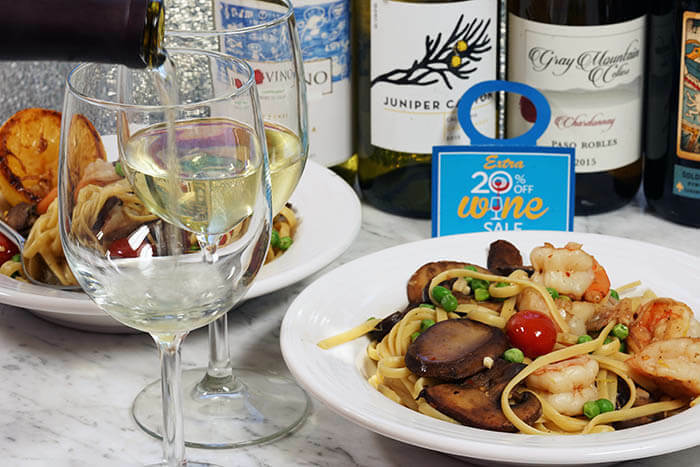 Pair Linguine Scampi with your favorite dry chardonnay. What do you serve with Shrimp Scampi? It’s definitely time to stock up and save – head to your locally owned Grocery Outlet! Every bottle is 20% off! Grocery Outlet Wine Sale is happening now! 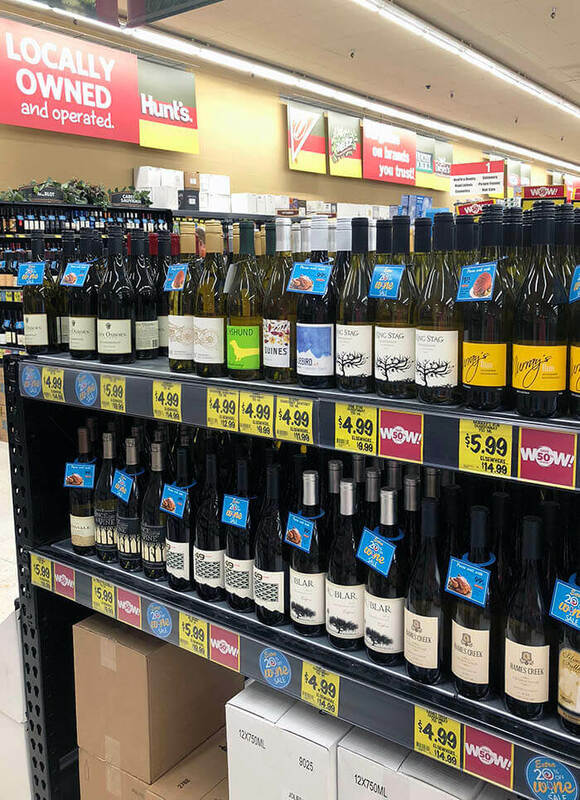 Grocery Outlet is a great place to shop because you can find some truly incredible products at an amazing price; especially during their twice-yearly Wine Sales! If you’re a wine lover stock up now! The upcoming Wine Sale is 20% off all bottles of wine! Now let’s talk about how easy this Shrimp Scampi Linguine Recipe is to make! Starting by putting a large pot of water on to boil. When it comes to a rapid boil, add a tablespoon of salt. Return to a boil and add the linguine. Next heat a skillet over medium heat. Add the butter and when it is hot and foaming add the mushrooms. 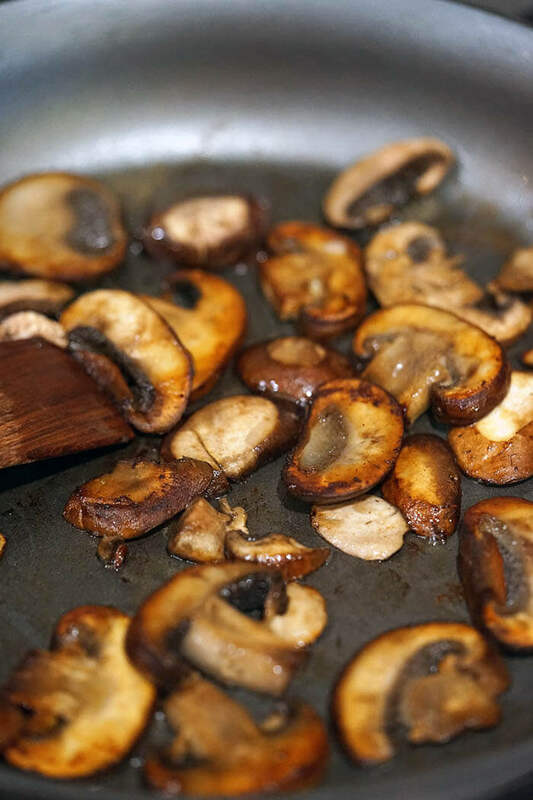 Start by sautéing the mushrooms. What is the secret to getting great color (great color = great flavor!) on mushrooms? Add them to a hot, sizzling pan and do not touch them or salt them. Allow them to sauté on side one for three-four minutes over medium heat before flipping. Sauté on side two. 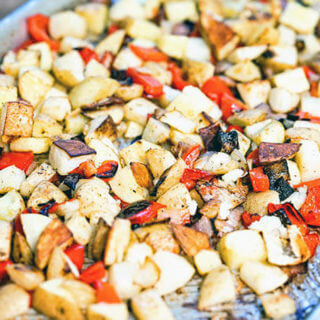 Now add the tomatoes and garlic – be careful, the garlic burns easily! Next add the shrimp and season with salt, pepper and red pepper flakes. Cook until golden on side one, flip on side two. Do not over cook! Wait until the shrimp are golden brown before turning. Drizzle in the wine and heat thru. Remove from heat and add the lemon juice and zest. Toss to combine. Next add the pasta and combine everything really well. Toss it together several times. Add in the frozen peas last, toss again. No need to cook them – the heat from the meal will warm the peas perfectly! Toss the pasta with the shrimp scampi and combine throughly. 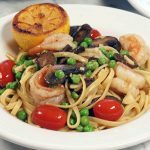 Shrimp Scampi Linguine combines Tender shrimp mixed with lightly sautéed vegetables in a light and lemony garlic and wine butter sauce. This meal is fancy enough for a dinner party but easy enough for a weeknight meal. It takes about 20 minutes from start to finish! It is light and flavorful with a pop of spice from red pepper and black pepper. 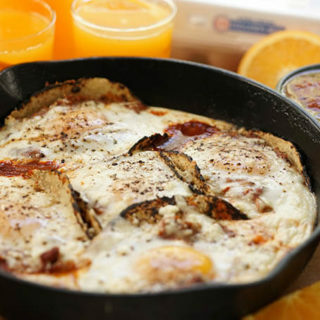 Super simple and so delicious it’s a meal your whole family will love it! Don’t you just love an easy meal that presents so beautifully? Simple and delicious, pairs perfectly with a green salad, crusty bread and a great glass of wine! 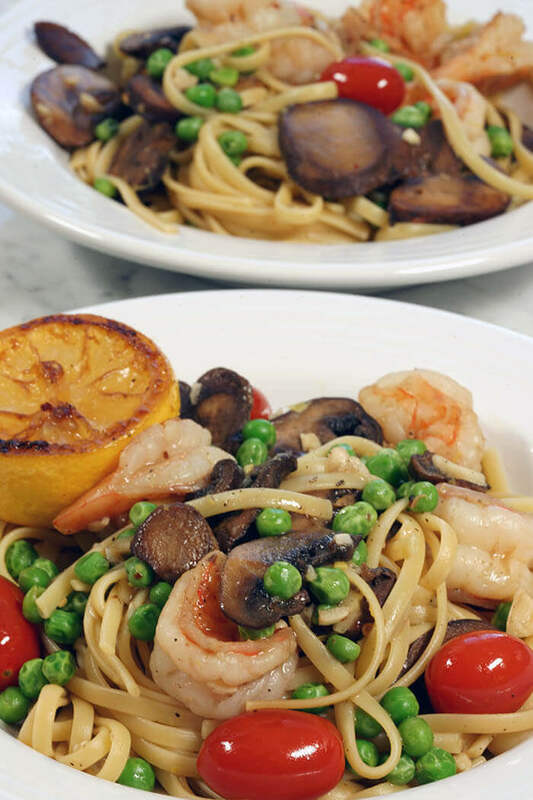 Shrimp Scampi Linguine combines tender shrimp mixed and lightly sautéed vegetables in a lemony garlic, wine and butter sauce. 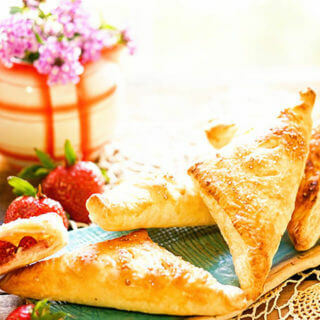 It is light and flavorful with a pop of spice from red pepper and black pepper. Super simple and so delicious it's a meal your whole family will love it! Put a large pot of water on to boil. When it comes to a rapid boil, add a tablespoon of salt. Return to a boil and add the pasta. Next heat a skillet over medium heat. Add the butter and when it is hot and foaming add the mushrooms. Allow to caramelize on each side - about three minutes per side. Now add the tomatoes and garlic - be careful, the garlic burns easily! Sauté for about one minute. Next add the shrimp and season with salt, pepper and red pepper flakes. Cook until golden on side one, flip on side two. Be careful, do not over cook! Next add the pasta combine everything really well. Toss it together several times. Add in the frozen peas last, toss again. No need to cook them - the heat from the meal will warm the peas perfectly! 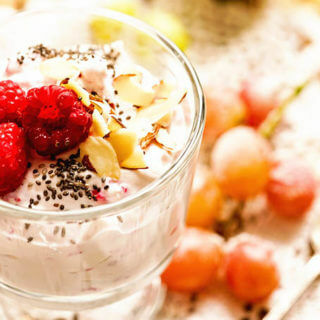 Definitely give it a try at home – this is so delicious! Enjoy Liza!!! This looks delicious! Pinning for later 🙂 I wish that there was a Grocery Outlet near me, that wine sale sounds awesome! Oh, and my sisters and I used to do the same thing as kids – always instigating and tattling! Thank you Ang – the sale has been awesome! Glad you enjoyed the read!!! Love all the flavors you used in here! Thanks Megan! 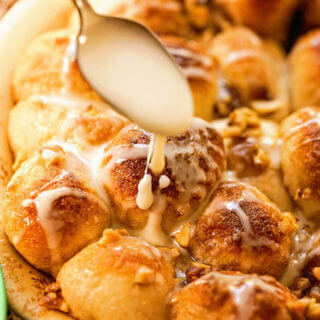 It really is an easy and delicious dish! I would love this for dinner! This looks amazing! I know what I’m making for dinner tomorrow! Enjoy Carolyn – love an easy and delicious pasta – hope you love it too! Wonderful! Great to know and so glad you enjoyed this meal!